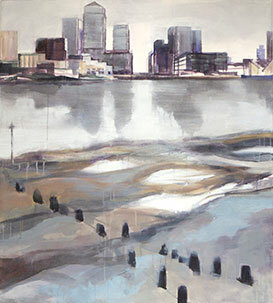 Wendy Brooke-Smith is a figurative artist inspired by transience and human intervention in the landscape, with a particular interest in the changing London skyline and the Thames. She first displayed her work at the Rolls Building in 2013, and has continued since then to develop her career with corporate commissions and successful solo exhibitions in London. 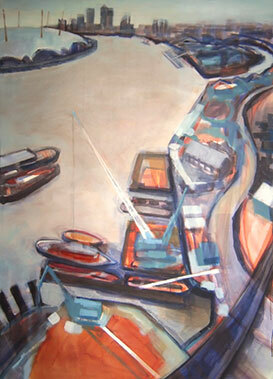 The RBAET is now delighted to welcome her return with a collection of paintings and charcoal drawings presenting viewpoints of the Thames towards Canary Wharf on display in the public areas of the 3rd floor. Wendy first exhibited at the Rolls Building from January until June 2013. Her subject matter ranged from container ports to building sites to quiet corners of the River Thames and resonated with the work of the High Court jurisdictions now based at the Rolls Building. The RBAET received a commission on sales that assisted the Trust in funding the development of its pilot educational programme. Wendy kindly left one of her paintings on open-ended loan to the Trust. The painting, a black and white aerial view of a construction site during the redevelopment of Ipswich Waterfront, can be seen on the 3rd floor.